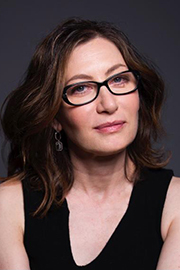 Annabelle Gurwitch is an actress and the author of I See You Made an Effort (a New York Times bestseller and Thurber Prize finalist - 2014); You Say Tomato, I Say Shut Up (coauthored with Jeff Kahn - 2010), and Fired! (2006). Gurwitch gained a loyal following during her stint cohosting Dinner & a Movie on TBS and years as a regular commentator on NPR. She’s written for the New Yorker, The New York Times, The Wall Street Journal, Los Angeles Times, McSweeney’s and The Hollywood Reporter. Gurwitch was the new anchor on HBO's Not Necessarily the News and hosted WA$TED on Planet Green network. Her acting credits include: Better Things, Seinfeld, Boston Legal, Dexter, and Melvin Goes to Dinner. A veteran of many lauded and even more misguided theatrical productions, she regularly performs at arts centers around the country. Gurwitch is a Jewish mother, a reluctant atheist, and an ardent environmentalist. She is empty nesting in Los Angeles.